WinAdmin is an iPhone application which uses the Microsoft Remote Desktop Protocol to allow you to access your Windows workstation or server. The new release, version 1.1.0 allows you to access Windows Vista and Windows Server 2008. The iPhone's multitouch functionality makes this application shine by allowing you to easily scroll around and zoom in/out of the desktop. It is one of the more expensive applications in the app store at $11.99, but for administrators using iPhone it is probably worth it. I ended up purchasing it. 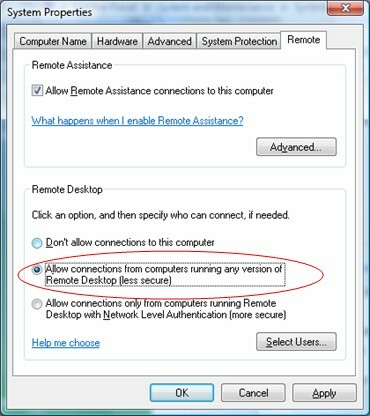 One caveat for Windows Vista and Windows Server 2008 systems; you cannot use the new more secure Network Level Authentication option which helps thwart Denial of Service attacks and malware. If you use a VPN and your internal network is secure you should be ok. The settings in Windows Vista can be found in Control Panel / System and Maintenance / System / Advanced System Settings - Remote tab. The Remote Tab in Control Panel / System and Maintenance / System / Advanced System Settings. The last week and half have been pretty busy with no time to blog. I was in Seattle and Redmond last week at my first Microsoft MVP Summit. It was well worth the time. In typical Microsoft conference fashion we received a parting gift, a Uniden Win1200 5.8GHZ wireless phone, which works with a phone line and Windows Messenger. You can make free pc to pc calls via messenger, low cost calls via Verizon web calling service, and also use the connected phone line (I plan on connecting it to my Sunrocket VOIP line). I have not yet successfully made a PC to PC call, I keep getting an error that tells to try again. I will have to follow up. This week I have been struggling with Microsoft ISA 2006. The problem ended up being with SP2 being applied to Windows Server 2003 R2. It seems SP2 has some security updates which affect ADAM (installed with ISA) and breaks authentication with Active Directory. This blog entry pointed me in the right direction. Then, every time I removed SP2, it would reappear, at the time I did not realize that the customer had setup a server with Microsoft's Software Update Service (SUS). If you want to use SUS make sure you exclude servers, too many thing can go wrong. A lot of extra hours were spent this week battling this issue. Things are stable now and the wizards in ISA 2006 make it a mindless exercise to setup inbound VPN and site to site VPN. The only real work is understanding the network topology to make sure you add the appropriate routes when you have multiple subnets and gateways. So far I am very impressed with ISA 2006. Last weekend was spent, moving my Directv Tivo DVR to our master bedroom which meant adding an additional LAN drop from my attic and reorganizing coax cables from the satellite dish. This was in preparation for the upgrade to HD equipment on Monday March 19th. Monday came with nobody showing up or calling. I called customer service. An accident prevented the installer from showing up, they were able to reschedule for the 20th. On the 20th the installer and his supervisor showed up. They checked out the premises and determined that I could not get HD because of tree height in my backyard (tall tulip poplars). Even though I can receive signals from Directv satellites at position 101 (standard definition satellites), it seems that the oval 5 LNB dish has to be angled down to receive the signal form the 3 HD satellite positions which makes it impossible to get a clear line of sight through the trees. I was and am still really bummed out. I was an early adopter of Directv and have been a customer for over 10 years and I was looking forward to using them for HD. This currently leaves me with 2 options; off the air or Comcast, although I will look into putting up multiple dishes. I decided to try Comcast out. They gave a Scientific Atlanta Explorer 8300HD DVR. I was leery at first, but was happy to find that the Thecus disk array and 2 500 GB Seagate drives I had purchased for the Directv HR20 DVR works with the SA Explorer 8300HD. The only issue is that I don't know how much of the TeraByte is going to be used, since the only status information I have found so far is percentage used. I need to record a set of shows and extrapolate total numbers of hours from the percentage used. Unfortunately when I came home yesterday the DVR displayed a message that it needed to be authorized after having worked for 24 hours. Very bizzare, I called Comcast and they told me they had to come out, They will be out today and I will report back. Maybe there is an issue with the return path but I do have a return path since my internet access works fine, I am clueless at this point. Nothing seems easy any more...I am hoping that Verizon completes the fiber wiring on my street shortly so I can try FIOS and compare it to Comcast. One good thing that happened this week is that I was able the get the Ventafax service to work with my new modem on Windows Vista. This allows me to receive faxes using my Sunrocket signature number using distinctive ring and email me the fax. I added the following initialization string of AT +VDR=0,2 (allows distinctive ring to flow through) and turned off the VentaFax voice features. I still need to test an outgoing fax with the Ventafax application, but I know that I can fax with the Vista's fax application.